Tailgating is recognized as one of the most dangerous actions a driver can take on our Illinois roadways. It is essentially defined as an automobile following another automobile too closely, thus reducing reaction time and causing many accidents. In some cases, drivers may not even realize that they were indeed tailgating until it is too late. Throughout the state of Illinois and across the nation, tailgating is becoming a huge problem for many motorists, with the National Highway Traffic Safety Administration stating that almost one-third of all rear-end collisions in the United States are caused by following too closely, or tailgating. Have you become the victim in a tailgating accident? At the law offices of Tapella & Eberspacher Law Firm, our auto accident attorneys believe that if you or a loved one has been injured by a negligent driver who was tailgating your vehicle, the victim may be eligible to receive compensation for their losses and damages including; pain and suffering, property damages, lost wages, medical expenses, and in some cases, funeral expenses. To learn more, complete the easy “Free Case Evaluation” form on this page – its 100% free or call our office at (855) 522-5291. We offer 100% FREE case reviews and at our law firm, we only get paid when we win. In nearly all instances, tailgating is caused by aggressive driving or road rage. It is often a product of individuals not taking the time to get to their destination, thus these individuals may feel as though tailgating may help them arrive at their destination sooner. Unfortunately, tailgating only increases a driver’s chance of becoming involved in an accident and injuring themselves and others in the area. In fact, some statistics have shown that tailgating accounts for a many of the 6.8 million traffic collisions that occur throughout America each year. As most drivers are aware of the repercussions of tailgating, some individuals fail to recognize these dangers and continue to operate their vehicles in a negligent manner, often times resulting in tailgating collisions. As a result, drivers across Illinois must increase our attentiveness and practice defensive driving habits to protect ourselves from these negligent individuals. Our car accident lawyers advise that drivers who are being followed too closely avoid applying the brakes quickly, altering speeds, flashing lights, or doing any actions to aggravate these already negligent individuals. These actions could further provoke the driver and lead to further injuries. Injuries resulting from tailgating accidents typically vary in severity. Of course, as with most accidents the speed of the travel and type of collision will typically determine the severity of injuries sustained. Furthermore, whiplash injuries are very common in tailgating accidents as a result of being struck at a great force from behind. 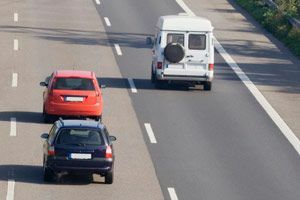 If you are suffering from injuries following an accident caused by a tailgating driver, our lawyers recommend seeking immediate medical attention. This will not only assure all of your injuries have been properly cared for, but these medical documents can also be used by our lawyers to help prove this negligent drivers actions did exist. At the Tapella & Eberspacher Law Firm, our attorneys are proud to assist clients in their pursuit for justice. Our attorneys will seek to obtain the MAXIMUM compensation benefits available for your injuries and have obtained MILLIONS in successful verdicts and settlements for our clients. With offices in Southern Illinois and Missouri, we are licensed to serve clients throughout the entire state of Illinois and beyond. To learn more about our law firm, we welcome you to contact us at 855-522-5291 today. At this time a member of our staff will collect vital information regarding your injuries, and then quickly connect you to an attorney ready to handle your specific case. Alternatively, if you would like our intake staff to contact you, simply complete the “Free Case Evaluation” form located on this page. It’s completely free and all of your information will remain confidential.